During the Fall exam period, space on the Library’s 5th floor will be used for students writing exams. Please be considerate of these students by keeping your noise to a minimum if you are working on the 5th floor. Thanks for your assistance. With the exam period in full swing and students studying in the library in large numbers, we remind you to be aware of your surroundings and to keep a close eye on your belongings. Although our security staff patrols the library regularly, they cannot be on every floor at once. In the last week alone, there have been no less than 4 laptop thefts reported in the library! If you have to leave your study area for any reason, take your belongings with you. We understand that it may be difficult to find study space at this busy time of year, but theft can occur in just a few seconds, especially is a thief is watching a particular area. Please do not rely on others around you to watch your belongings, as they may be distracted by their own studying. Make this exam period less stressful by protecting yourself against theft. Watch your belongings and encourage others to do the same. Report any suspicious activity to security and library staff. 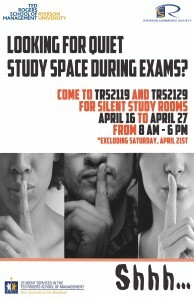 We are pleased to announce that additional silent study space has been secured for the exam period! 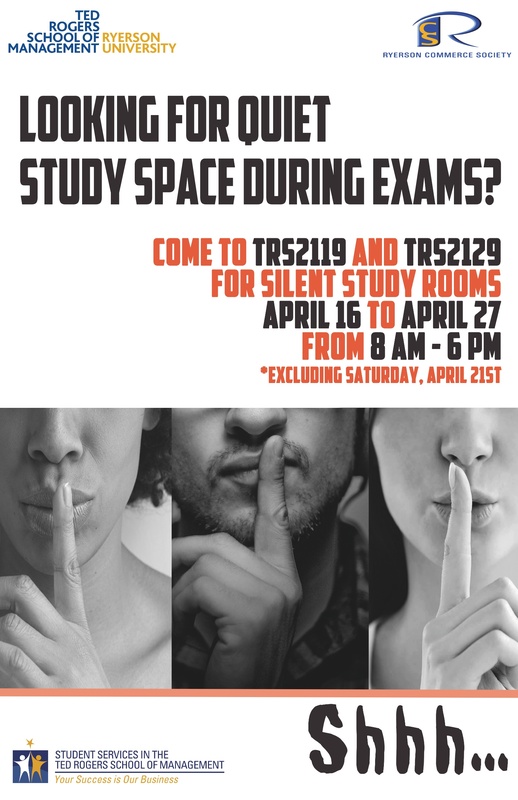 Thanks to student feedback and the help of Student Services in the Ted Rogers School of Management, silent study space will be available from April 16 – 27 (excluding the 21st) in rooms TRS 2-119 and TRS 2-129 from 8am – 6pm. 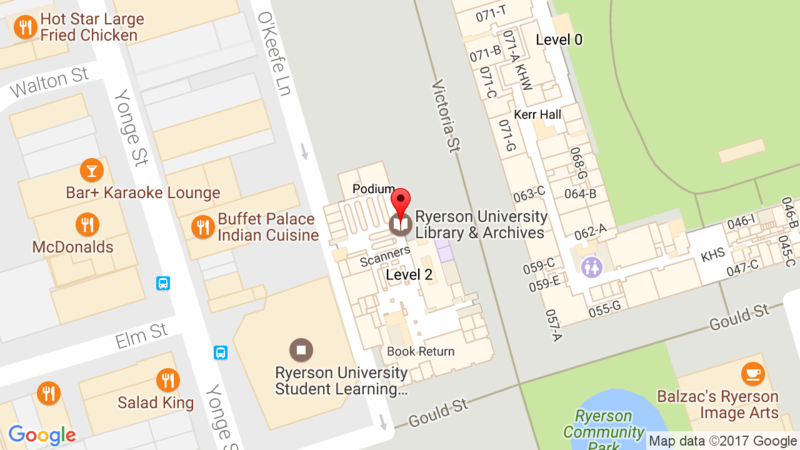 The Ryerson Commerce Society will be monitoring the space during these hours. Please be considerate of others while using this space. We hope you find it to be a productive workspace during the exam period. Thanks to all who made this possible. Let us know your thoughts on this initiative! 1) Use the appropriate space for your study needs. If you need to chat with your classmates about your coursework, the quiet and silent floors may not be the best place to study. If you are unsure about how much noise is tolerated on each floor, refer to the image below. 2) While the library does allow food and drink in the library, try to avoid hot and odorous foods that may irritate allergies or be distracting to other users. 3) If you are not using a space, vacate it so that others may study there. It is inconsiderate to leave your things in a study space while you are taking lengthy breaks, having lunch, etc. 4) DO NOT leave your belongings unattended. We cannot stress this enough. The Library is not responsible for theft. Our security officers patrol the floors regularly, but they cannot be everywhere at once. 5) If you experience problems while studying and need to reach staff, contact us at the Reference Desk. If you are unable to come downstairs, call us at (416) 979 5055 (option 3) or use our chat service. Good luck to all students on exams and end of term assignments! With exams fast approaching, many students have expressed concern about the need for quiet study space in the Library. The Library has asked Security to increase their patrols of the quiet study floors during this period, which includes floors 6, 9 and 10. We would ask students to respect their peers and be mindful of the need for quiet study, particularly on these floors. If students encounter others who are not respecting quiet study, please contact one of our service desks on the main floor with details. Staff can then contact Security, who can then visit the location in question as soon as possible. Thank you for your cooperation, and best of luck with exams!